Marik mods the M 130 by replacing the factory ribbons with new ribbons made from thinner aluminum, using traditional full-length corrugation. He also swaps the stock transformer for one of his own custom-wound ribbon-mic transformers. Stephen Sank’s “DX” mod for the beyerdynamic M 130 involves replacing the stock, semi-rigid ribbons with twin fully-corrugated ribbons made from original RCA 77-DX ribbon material. The result is a massive reduction in distortion, an improvement in tonal balance, and an extension in frequency response. The M 130 is a passive ribbon microphone. It provides an uncolored sound with evenly matched response from the front and back of the capsule — making it useful as the “side” channel in Mid-Side applications. The dual ribbons in the M130 are back-to-front, rather than side-to-side as in some Chinese dual-ribbon mics. 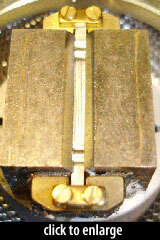 This was done to increase the mic’s output level (still a modest 1.0 mV/Pa). The two ribbons are mounted 0.5mm apart. 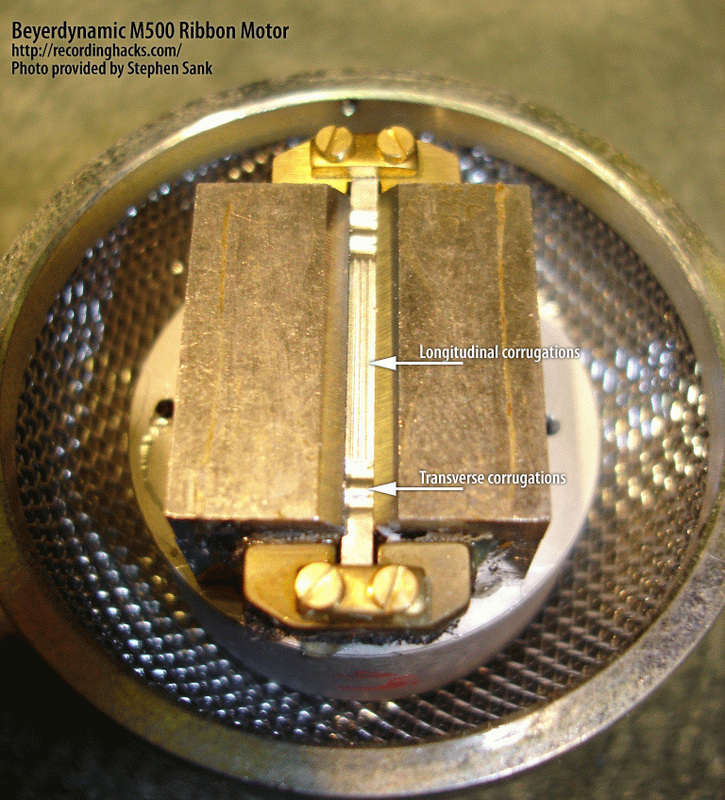 Even with a double system, the M 130 is no louder than other ribbon microphones, because thanks to its tiny design, very little diaphragm surface comes together… The system displays additional effectiveness with its thick soft iron wire around the whole system… [T]his increases the magnetic field (more output)… [and] acts as an HF reflector, which improves treble reproduction. The ribbon corrugation pattern is somewhat unusual, in that the ribbon is creased longitudinally for most of the length of the ribbon, and corrugated horizontally only near the ends. This makes the ribbon somewhat rigid as compared to the ribbon element in other microphones. The pictured ribbon is from an M500, but the corrugation pattern in the M130 is identical. The ribbons in the M 130 and M160 measure 0.056'' in width, and approximately 0.6'' in length. The stock ribbon is only corrugated in the normal sense, meaning in a manner that makes it flexible, at the ends, and [uses] shallow corrugations. The whole middle section is rendered rigid by the lengthwise pleats. We have discovered a nontrivial discrepancy between the official, published frequency-response graph for this microphone and the hardcopy included with a production sample. The published graph shows a flat response (±1dB) from 100Hz–7kHz, with smooth rolloffs above and below. 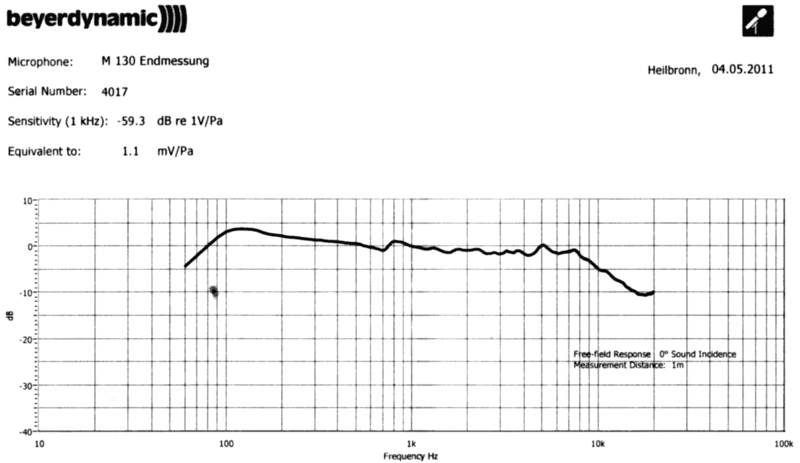 The chart for a sample microphone shows a +4dB boost from 100–150Hz and a somewhat choppier midrange. The graph included within this profile is from the production sample. The beyerdynamic M 130 is also known as: M130.